When we started researching our family history more than 40 years ago, one of the things we soon discovered about the Growdon or Growden family was that everyone said they came from Cornwall, and that they were all related. Louise Deragowski of New Orleans, one of the first Growden researchers we made contact with, quoted another relative as saying that “they lived so close, they traded roosters”. My mother was Ella Growdon, and her father George Growdon came from Cornwall in 1876 at the age of three, when his father, William Matthew Growden, came to work in the Cape Government Railways, building the rail line inland from East London. We soon traced his ancestry though is father Matthew Growden, and his father William Growden, who married Elizabeth Saundercock, and there we were stuck. It took a couple of years to be fairly certain my my relationship with Louise Deragowski (she was my 4th cousin). She was in contact with lots of others, including Sylvia Reebel, who researched the Pennsylvania Growdens, and we all owe a great debt to those two, because much of what we know comes from them, though they never did manage to discover how they were related. We discovered some other Growden families, who came from the same area of Cornwall, but no links between them. We made a Growdon family web page, and invited members of the various Growden families to help us find the links between them. 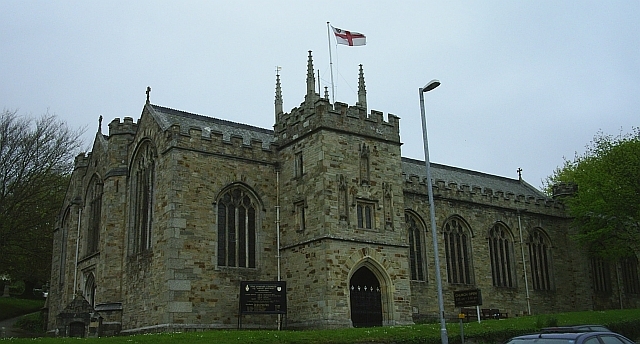 Then Marguerite Growden, who was originally from Australia, and is now living in Canada, discovered some Growden baptisms in Withiel, Cornwall, that seems to provide the missing links that draw all these families together. 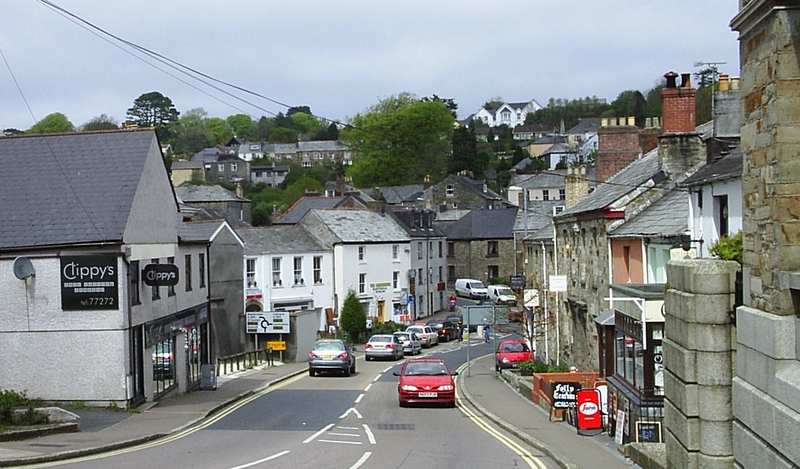 Withiel, Cornwall, where the Growden family lived in the early 18th century. 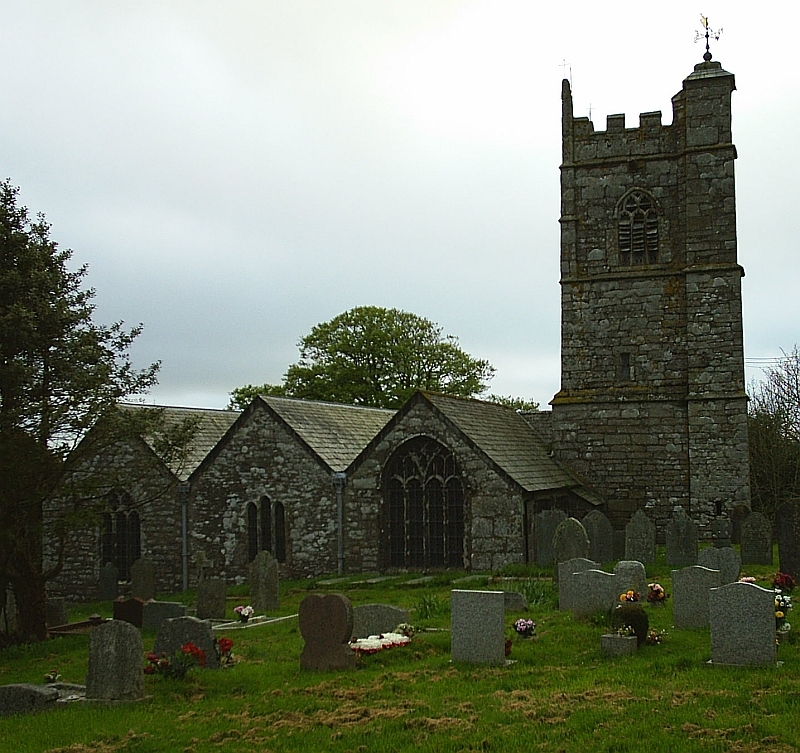 Laurence Growden married Elizabeth Vanson in Withiel in 1719, and had four children, Laurence, Matthew, Joseph and Elizabeth. Most of the Growden families in the world today are descended from Laurence and Joseph. Joseph Growden (1726-1811) married Grace Jeffery and they are the ancestors of the Pennsylvania, Maryland, Ohio, California, and Yorkshire Growdens. The exception to this is the New Zealand Growdens, who are descended from Edwin Williams alias Edwin Growden, who was the stepson of Thomas Growden who married Edwin’s mother Charlotte Hawke. Edwin took his stepfather’s name and passed it on to his descendants. Some of these links are based on circumstantial evidence, but they seem the most likely explanations of the relationships that we have been able to find. 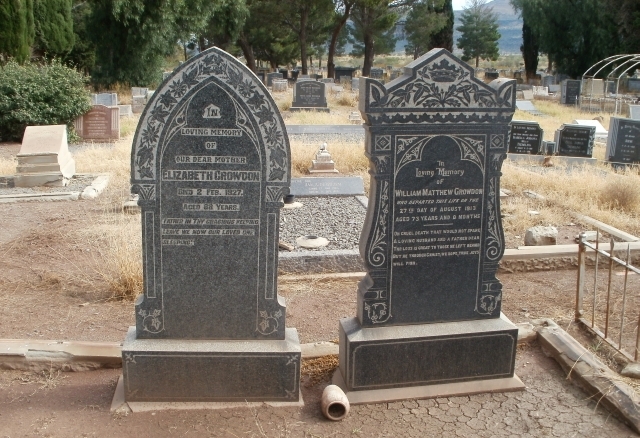 Grave of George Growden and Ann Maynard, ancestors of the Australian Growdens, in Wallaway, South Australia (click to enlarge). Marguerite Growden, who found these links, has also written a book on the Australian branch of the Growdens, and so when it comes out a whole lot more people can find it interesting, knowing that she is writing about our cousins. 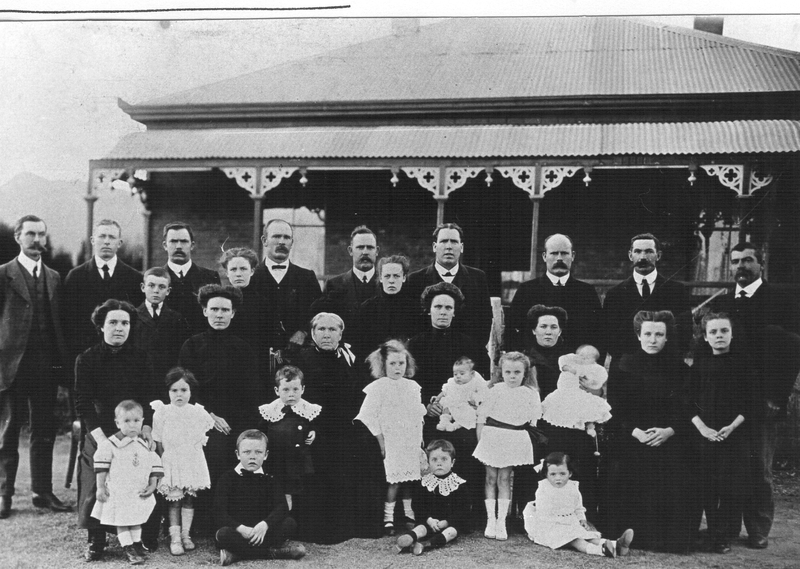 Though some of the other branches of the Growden family have descendants in Australia, most of those bearing the surname Growden are descended from George Growden and Ann Maynard, who emigrated from Cornwall to South Australia in 1864. Most branches of the family seem to have used the spellings Growden and Growdon interchangeably, and a few earlier records have the spelling Grouden. But most seem to use the Growden spelling. Our South African branch seems to have used the Growdon spelling almost exclusively. Continued from Somerset, Devon and Cornwall. got married in 1792, and the first of their children were born. 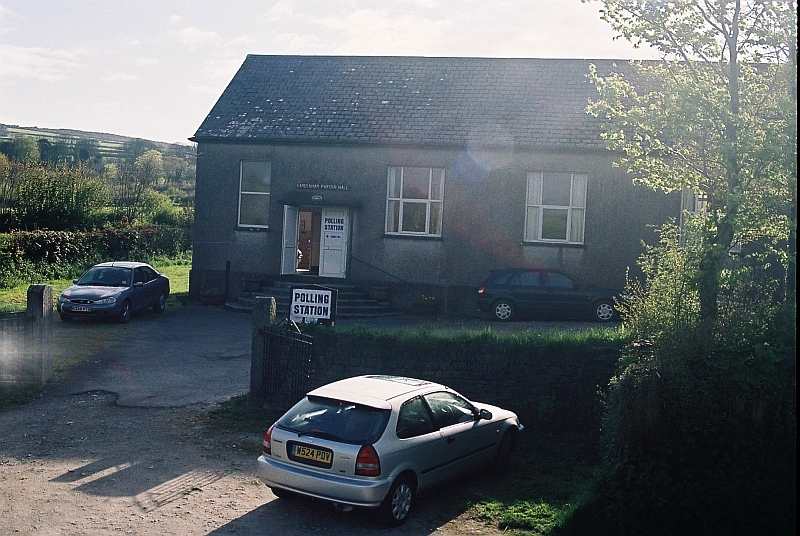 Just over the road from the church was the village hall, where they were setting up the polling station for the general election. The grass in the churchyard was dewy, but we found a number of tombstones of Sandercock and related families, and took photos of them with the digital camera and also of the interior of the church, where the pews were very ancient indeed, and it was quite a thought that ancestral bums had sat upon those pews. 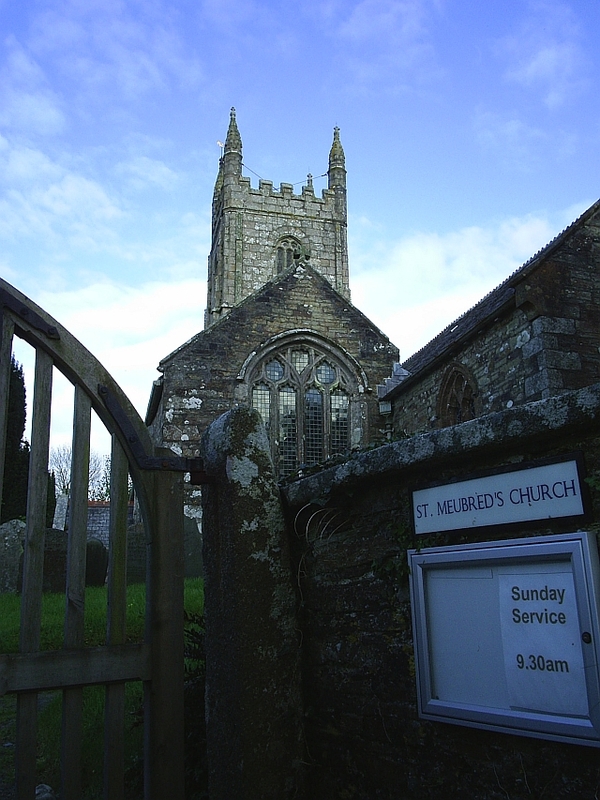 St Meubred’s Church, Cardinham, where William Growden and Elizabeth Sandercock were married in 1792. 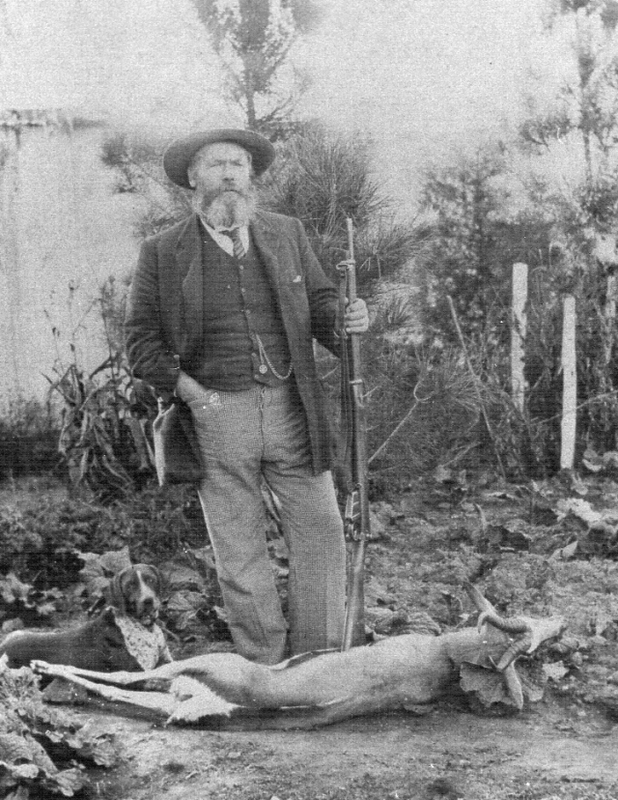 The Sandercock family went quite a way back in Cardinham, but William Growden appeared from nowhere, and we have not been able to find where he was born or who his parents were. You can see more about the church and these families here, and the gravestone of the earliest Sandercocks is here. 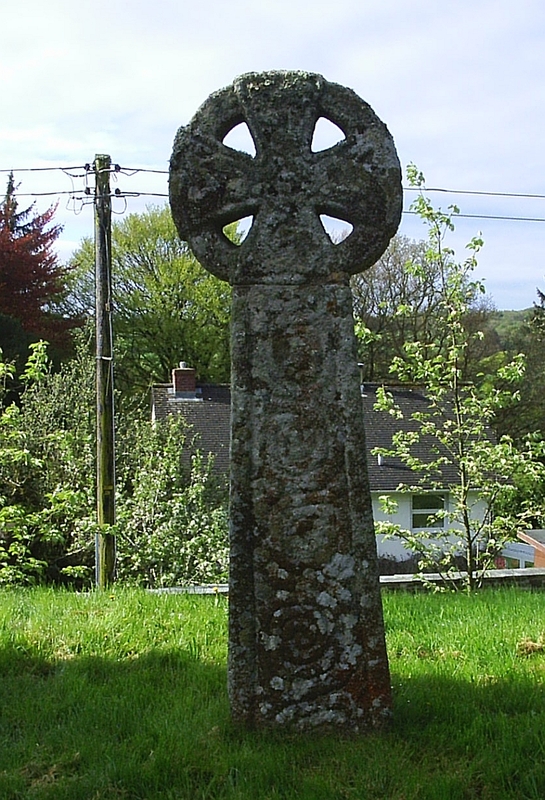 The church is also known for its Celtic style wheel-headed crosses, which are said to be the oldest in the area. If you are reading this because you are interested in family history, and would like to learn more about these families and discuss them with others, you can find a discussion forum for the Growden family here, and one for the Sandercock family here. Carvings at the end of one of the pews in St Meubred’s Church, Cardinham, where ancestral bums had sat. 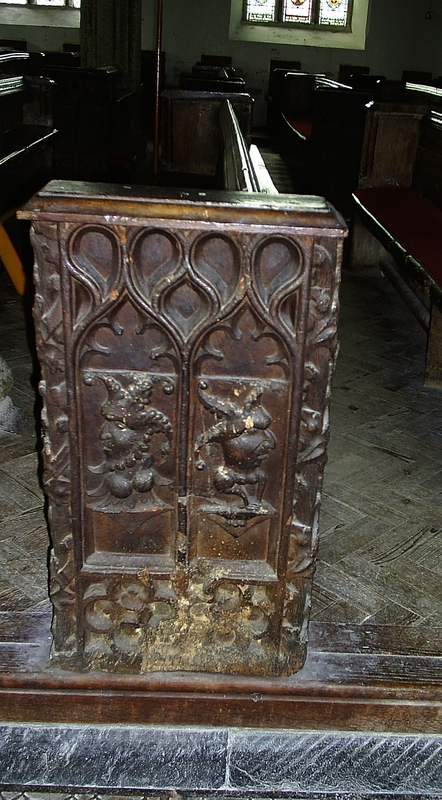 Each pew seemed to have a different carving. From Cardinham we drove in to Bodmin, about 6 km away, and bought some more detailed Ordnance Survey maps, and then went to take some photos of the Growden family home at 3 Higher Bore Street, where the Growden family was living in 1861. My great grandfather, William Matthew Growden, was ten years old when they were living there. 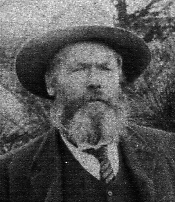 His father, Matthew Growden, was shown in the census as an agricultural labourer. His mother was Christiana Dyer, originally from Roche in Cornwall. We also went to Scarlett’s Well, not far away, where my great grandfather, William Matthew Growden, was born in 1851. It was very interesting, as the well was a holy well, reputed to have healing powers. Next to it was a cottage that could well have been where the family lived, because it was the only dwelling in the vicinity. Though there had been some modern additions, the basic house looked very old, and it also made sense of Matthew Growden’s occupation as a “woodman”, someone who took care of the woods on the land. 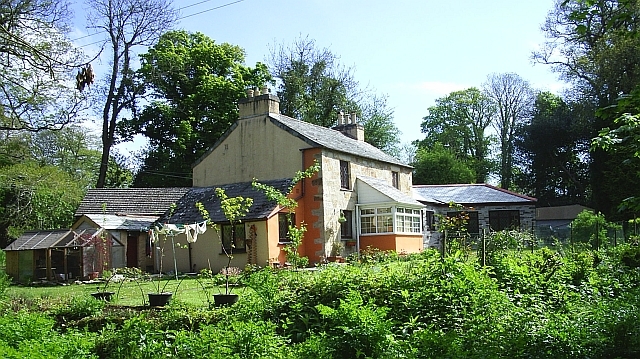 For more pictures of the area, including the cottage and William Matthew Growdon, see here. We went on to Penpillick, near Tywardreath, whiere my grandfather, William George Growdon, had been born, and seeing an advertisement for cream teas went to a farmhouse and had some, but like so many other such places, the people were not Cornish, but had moved here from elsewhere a few years ago. They had a nice smooth dog, called Manic Mabel. 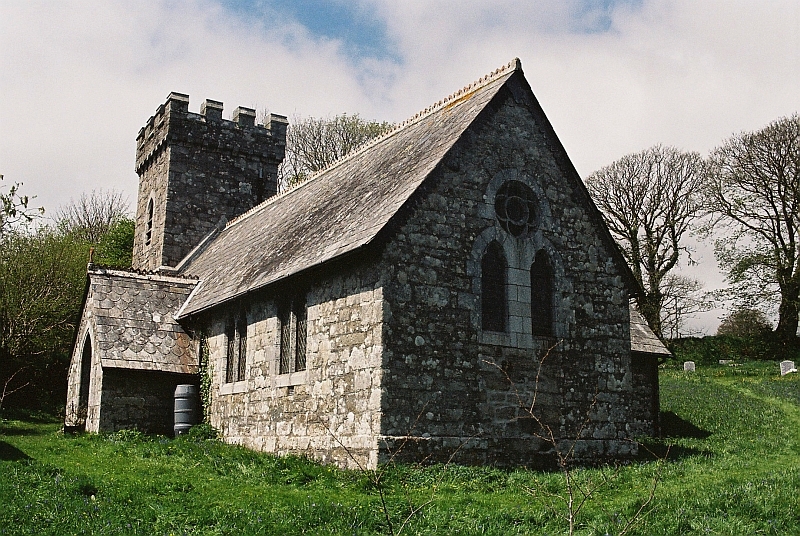 We took some photos of the parish church in Tywardreath, but did not stay very long, because the family had not lived there very long either. We went to Par to look at the beach, and drove East along the the south Cornwall coast towards Fowey. There was a footpath along the coast, but we did not walk along it, as we did not have enough time. If we ever win the Lotto and can afford to have a return visit it might be fun to do that. We turned inland at Fowey, and drove through Lostwithiel and St Neot. 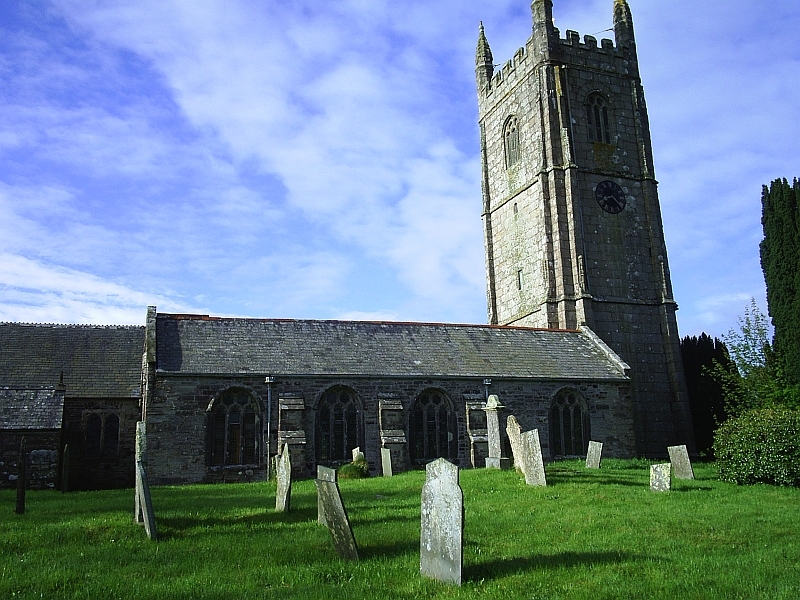 St Neot was where another Growden family had lived, though we have not found any link between it and ours. 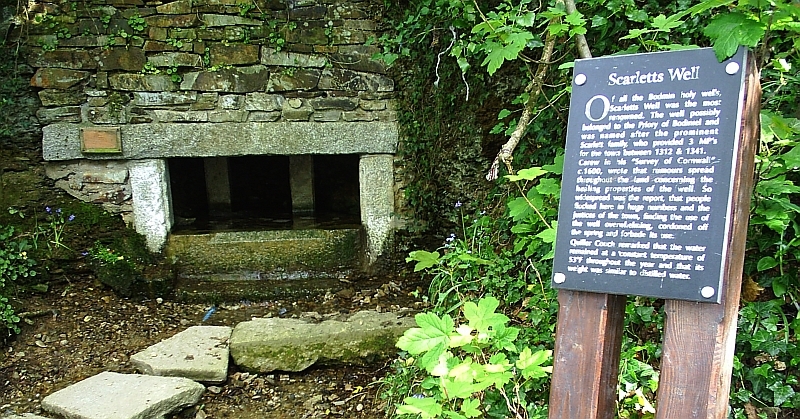 From there we went past the Dozmary Pool, where King Arthur’s sword was supposed to have been thrown after his death. It did not look much different from the Colliston Lake on the other side of the road. 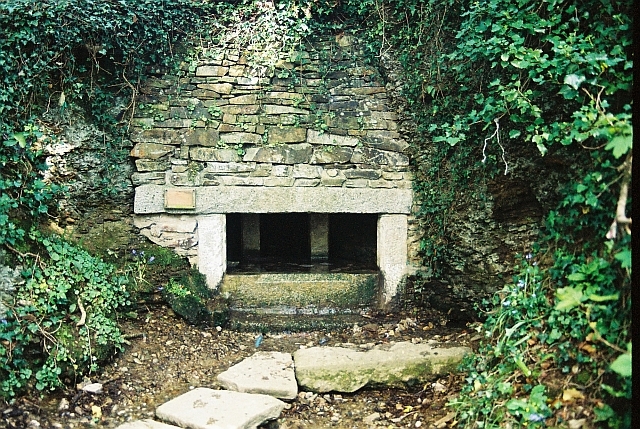 Dozmary Pool, Cornwall, where King Arthur’s sword is said to have been thrown after his death. 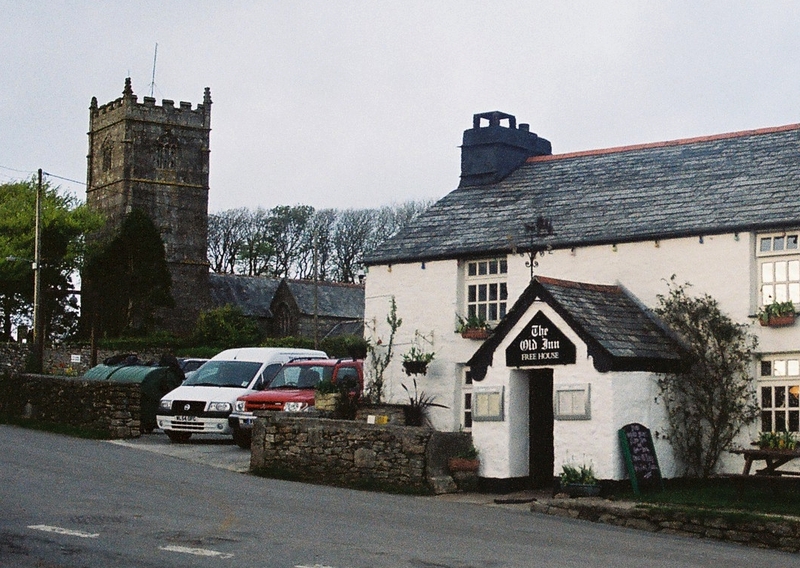 It was lunch time, and we went to Jamaica Inn nearby, but it looked too touristy, and very crowded. It was on the A30, the main road through the area, and it looked as if every passer-by had had the same idea. 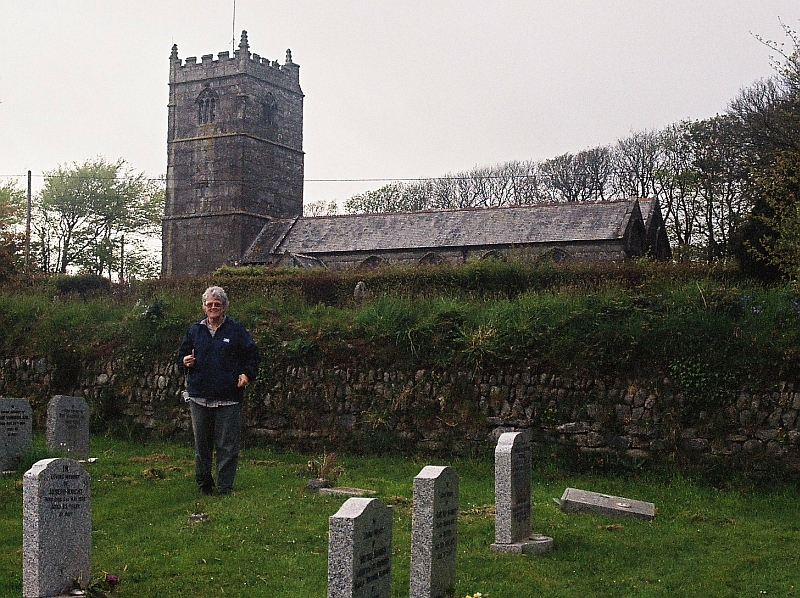 Instead we went to look at the parish of Temple, where Mary Ann Tilly had come from. She was my great great grandmother, and had married Richard Greenaway of St Breward, and their daughter Elizabeth Greenaway had married William Matthew Growdon. 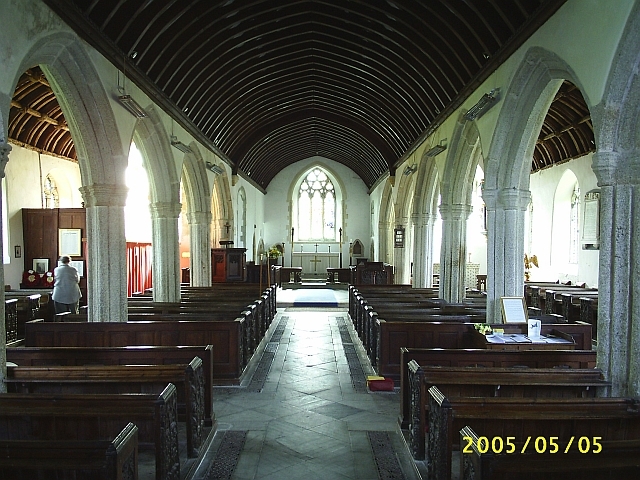 Temple Church, Cornwall, 5 May 2005. Temple was a tiny village, but there were lots of cars there, and at first we thought that the entire population had come to vote all at once, but then we saw strangely dressed people, looking like druids or something, though some were dressed as friars or knights in suits of armour. They seemed to be coming up from the church, and it turned out to be a medieval wedding, and we spoke to some of the guests. 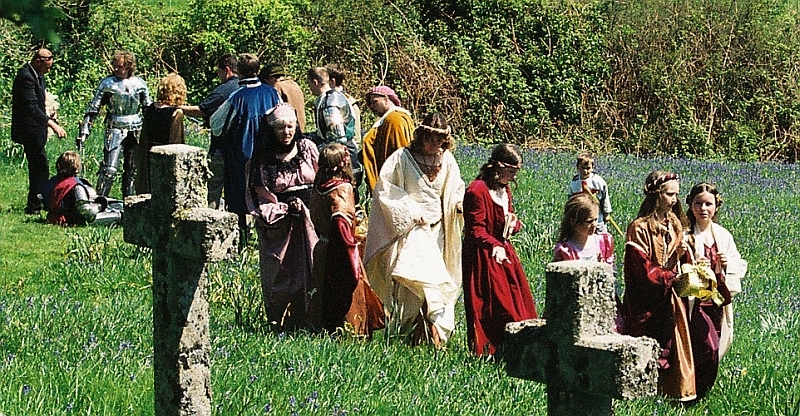 Medieval wedding at Temple, Cornwall. 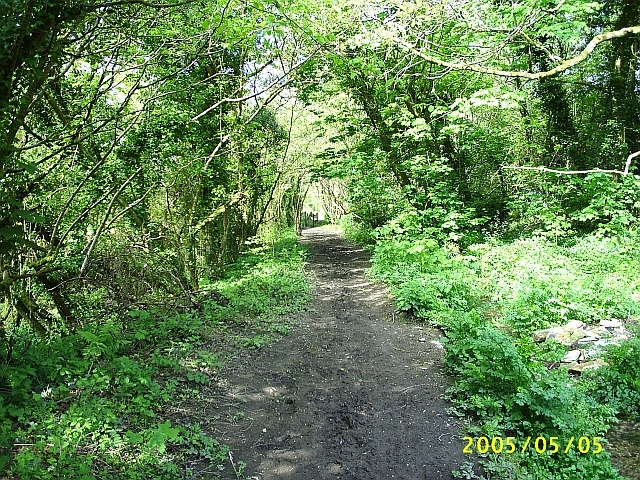 5 May 2005. We then drove to St Breward, thinking to have lunch at the pub there. 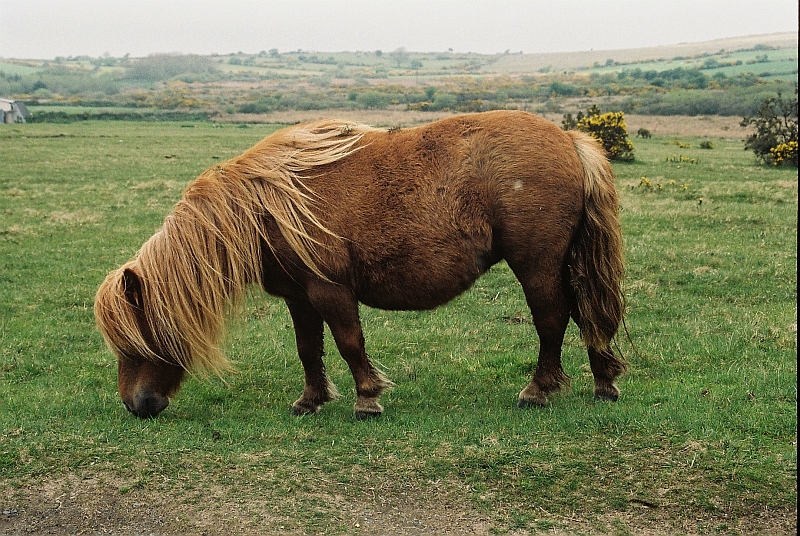 We drove across Bodmin Moor from Temple, and the road was on the surface instead of in a sunken lane, so one could see the horizon, and there were ponies that appeared to be wild wandering about on the moor. 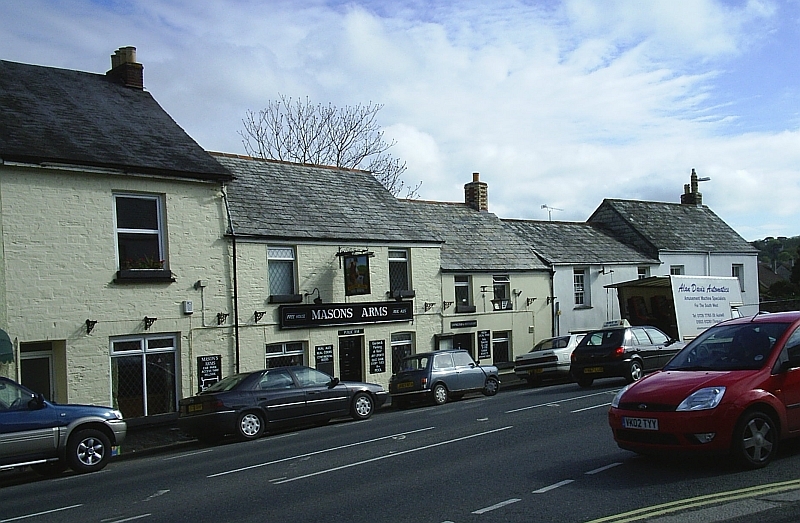 It was 2:30 by the time we got to St Breward, and they stopped serving food after 2:00 pm, so we went back to Bodmin, to Weaver’s tea room, over the road from the Weaver’s bar where we had eaten the previous evening, and there at last they did have Cornish pasties on the menu. The woman running the place was from North London, however. There don’t seem to be any Cornish people around. She said she worked part time, and lived in Blisland, near where we were staying, and she said there were still some Greenaway families in the village. walls, but there were no Growden ones. The church was closed at 3:00 pm. Though it was supposed to be western Ascension Day, there didn’t seem to be any services at any of the churches we had visited. There was a museum with exibits showing the history of Bodmin, and and we went up to The Beacon, a hill with views all around, but the day wasn’t clear enough to see very much. There was also an obelisk, a memorial to Sir Walter Raleigh, on top of the hill. We returned to St Breward, and wandered round the churchyard, taking pictures of tombstones, as there were several Greenaway ones, some quite recent, and had supper of sausage egg and chips at the pub, which was quite good. The sausages were real, and not like the bread-filled Walls sausages that were all one could get in England 40 years before. We went down to Blisland again, and went to the church there, and took more photos in the churchyard, where the old school was being used as a polling station. Then went to the pub which was quite crowded, and had a beer, and were joined by a couple who had been at the medieval wedding at Temple, Martin and Bemi Murphy, and chatted to them for a while. They were originally from Manchester, but now lived at St Ives, where they ran an ice cream van, and they had made most of the costumes for the wedding. When we got back to Trewint farm we went to bed, and watched TV for a while, when the first election result was announced, which was Sunderland South, which Labour held with a reduced majority. Continued at Cornwall to Morgannwg, 6 May 2005.